Oil painting on canvas, dimensions 40″ x 30” (102 x 76 cm), 2012. This painting echoes the idea(s) present in my previous work (“Moonways – Mediterranean Nights”). 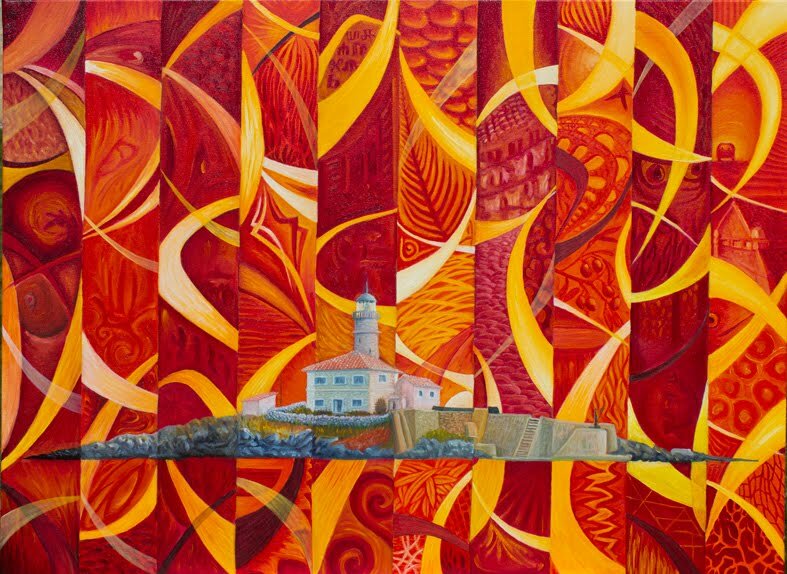 Numerous similarities – division in ten vertical strips patterned in dark and light tones with sharp discontinuation with each other applied to the background and foreground (but not on the main landscape), typical Mediterranean architecture, stylized light-path shapes, dreamlike atmosphere, half hidden shapes that could be seen as different objects with different meanings, the size, etc., dictated the name for the painting – being the sister painting to the previous one. I usually don’t paint pictures in the same “style” (hopefully, I will find some time and room to give an explanation on that), but this was an exception I couldn’t suppress: “Moonways” just needed it. They should probably be placed on the wall next to each other. This picture is actually a self-portrait in some way – myself being the island. Thoughts about Mediterranean still occupy my mind and there will certainly be more paintings inspired by the area, but they might be painted in a different manner.